One night Jim, a quiet wine steward, wakes to find two men trying to steal his car. Against the petitions of his wife, he goes outside to get the plate number of the thieves’ truck. Instead, something comes over him and he drives away in their truck until he recovers his wits and realizes what he’s done. When Jim learns that the two would-be thieves are brothers with a history of violence, he soon finds himself over his head in a mire of sinister events and must risk everything to regain what he can of his life before that night. “There are books that you can’t put down, and there are books that won’t go away even after you put them down, the force of their moral conundrums haunting the stories of our own lives. 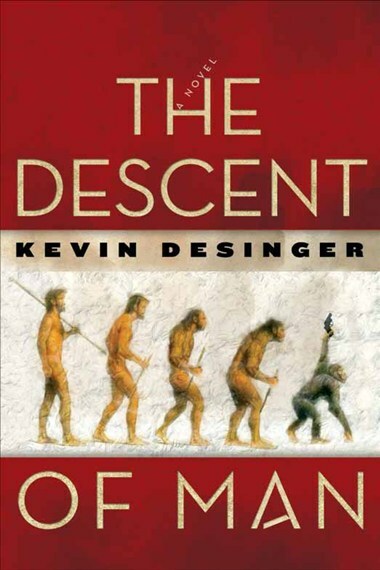 The Descent of Man is a spectacular showcase for both literary virtues—the riveting tale of a modest but perfect life under assault, and a resonating challenge to our own self-knowledge, the authenticity of that knowledge, which can only be confirmed through crisis. A truck with its lights out idled in the street. White steam pulsed from the tailpipe and drifted off, but the truck made no sound. From our bedroom window I could make out the motionless shapes of two men on either side of the truck, facing each other. They both turned toward our house, but I was able to step back before they looked up to the second floor, where I stood in the dark. I recalled having been awakened by a clank like you hear from a distant game of horseshoes, but not why it had drawn me to the window. Marla slept on, but she can sleep through anything. When I peered out again, both figures were standing together on the near side of the truck. They were studying our car. Even after I realized that the sound had come from a piece of steel striking the pavement, an element of disbelief kept me from piecing together what was happening. My sleepy forty-year-old brain plodded through the stages of cognizance, from seeing to understanding. In college philosophy I had learned the difference between immediate and mediate perception. Immediate: two guys. Mediate: I recognize them as two guys. The first is simply the mechanism of my eyes discerning shapes in the visual field; the second is my brain making sense of the shapes. Both stages happen at the speed of thought—the first perhaps even faster because it happens before thinking interferes. Either I’d skipped the next class or we hadn’t covered a third stage of perception (maybe making sense of the action), but it took what seemed like forever: Two guys are stealing our car. The fourth stage, let’s call it self-awareness, quickly followed: I’m standing here like an idiot watching two guys steal our car. Kevin Desinger graduated from the Iowa Writers’ Workshop before moving to Portland where he wrote for the Willamette Week, the Oregonian and a number of regional publications. An earlier short story appeared in The Missouri Review. This is his first novel.